Should standing be the new sitting? Home > Blog > Should standing be the new sitting? Most of us don't question our daily routines at work. But if you spend most of your day sitting down in an office chair, your future health could benefit from one particular addition to your office furniture. Research over the last few years has discovered that too much time in a sedentary position can lead to health problems such as heart disease, physical injury and colon cancer.Comcare, the Commonwealth statutory body charged with improving occupational health and safety, has even published a helpful guide to reducing sedentary work. Click here to view guide. One of the tips in Comcare's guide is to use a height adjustable office desk, which gives employees the option to work either standing or sitting.Height adjustable office desks and workstations can be used for individual workers or in a meeting room. Emanate Design offers a range of height adjustable workstations, including electronic, manual and technician adjustable options. Our most popular desk is the H frame electronically adjustable desk, which gives employees the quickest and simplest option to alternate their sit-stand working. Height adjustable desks are also available in A and C frame designs. Manually adjustable desks are great for the more budget-conscious company some are simple enough for the employee to self-adjust, while others will require somebody in the office to be trained as the 'technician'. Emanate Design's height adjustable workstations have different height ranges. For example, the A frame Fairway workstation has a manual adjustment from 725mm to 1,175mm, while the electronic version is flexible between 650mm and 1,240mm. walking around the block at lunchtime. There are other tips to reduce prolonged sitting in the Comcare publication. 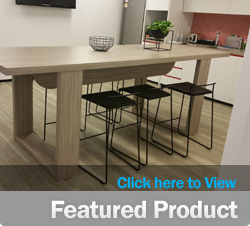 For more information on height adjustable workstations and desks plus matching office furniture, please call Emanate Design in Sydney on (02) 9517 4093 or click here to see more of the range.